Quite some time ago, I posted a short educational video that describes how BRCA1 and BRCA2 mutations cause cancer. In short, when a person who has a mutation in one of these genes is exposed to environmental factors that cause DNA damage, they simply don’t repair the damage with the same efficiency as the general population. Over the course of their lifetime, the incremental exposures to relative small and seemingly safe doses of ionizing radiation (which is everything from UV light to X-rays to gamma radiation) statistically accumulate damage (or the effects of damage and improper repair) until the probability of developing cancer becomes almost certain. This is because BRCA1 and BRCA2 are both part of a molecular process that is very similar to the spell-check on your word processor (in oncology parlance, these genes are known as caretakers of the genome for this specific reason). When these genes don’t work, mutations accumulate faster and eventually results in cancer. Its because of my interest in this aspect of cancer biology that I felt compelled to review the safety reports released on the TSA website here. However, my interest is not only professional, but also personal. My grandmother died of breast cancer in 2005 after being in remission for 20+ years. While she was never tested for either BRCA1 or BRCA2, her family history indicates that there is a strong probability of one of these mutations running in my family. Including my grandmother, at least four of her siblings developed cancer: two died of breast cancer, one developed a rare form of leukemia and another died of skin cancer. All of her female siblings had cancer, and its noteworthy that her mother died of a very young age (maybe 30’s or early 40’s) of an unknown (to me) cause. For these reasons, I fear that inadequate safety evaluation of these machines could unduly expose my family (and myself) to levels of radiation that might be harmful should this high familial cancer rate in fact be hereditary. In order to really understand these concerns, I think its important to consider the type of radiation used in these scanners, which the TSA has described as ‘soft’ and ‘safe’. First, we need to clarify the definition of ‘soft’ vs ‘hard’ X-rays. The TSA has been stating that the X-rays used in the back scatter machines use ‘soft’ X-rays, which are defined as radiation between 0.12-12 keV (or kilo electron volts) and are generally stopped, or absorbed, by soft tissue or low density matter. ‘Hard’ X-rays are between 12-128 keV and are absorbed by dense matter like bone. 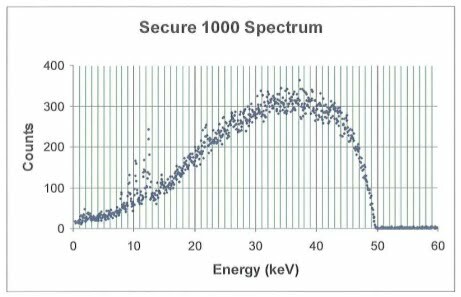 According to the TSA safety documents, AIT uses an 50 keV source that emits a broad spectra (see adjacent graph from here). Essentially, this means that the X-ray source used in the Rapiscan system is the same as those used for mammograms and some dental X-rays, and uses BOTH ‘soft’ and ‘hard’ X-rays. Its very disturbing that the TSA has been misleading on this point. Here is the real catch: the softer the X-ray, the more its absorbed by the body, and the higher the biologically relevant dose! This means, that this radiation is potentially worse than an a higher energy medical chest X-ray. With that being said, because the scanners have both a radiation source AND a detector in the front AND back of the person in the scanner, it is actually possible for the hardware to conduct a classic, through-the-body X-ray. The TSA claims that the machines are not currently being used in that way; however, based on the limited engineering schematics released in the safety documents, they could be certainly be easily reconfigured to do so by altering the aluminum-plate (or equivalent) filter or by changing the software. So the hardware has the capability to output quite high doses of radiation, however a biological dose is a function of the time of exposure as well as the proximity to the source and the power of the power of the source. Unfortunately, it is difficult to determine which zones in the scanner are ‘hottest’ because that information is masked in the document. An excerpt of the safety evaluation from Johns Hopkins is shown below to give you sense of how much other information is being withheld. Ultimately my point is this: even though the dose may actually be low, these machines are capable of much higher radiation output through device failure or both unauthorized or authorized reconfiguration of either hardware or software. Which brings me to how the scanner works. Essentially, it appears that an X-ray beam is rastered across the body, which highlights the importance of one of the specific concerns raised by the UCSF scientists… what happens if the machine fails, or gets stuck, during a raster. How much radiation would a person’s eye, hand, testicle, stomach, etc be exposed to during such a failure. What is the failure rate of these machines? What is the failure rate in an operational environment? Who services the machine? What is the decay rate of the filter? What is the decay rate of the shielding material? What is the variability in the power of the X-ray source during the manufacturing process? This last question may seem trivial; however, the Johns Hopkins Applied Physics Laboratory noted significant differences in their test models, which were supposed to be precisely up to spec. Its also interesting to note that the Johns Hopkins Applied Physics Laboratory criticized other reports from NIST (the National Institute of Standards and Technology) and a group called Medical and Health Physics Consulting for testing the machine while one of the two X-ray sources was disabled (citations at the bottom of the page). There also appears to be unit conversion error in the Appendix of the report, which was recently cited by the FDA in response to the UCSF scientist’s letter of concern, which might mean that the relative skin dose is 1000-fold higher than the report indicates (pg Appendix B, pg ii, units of microSv are used in an example calculation, when it appears that units of milliSv should have been used). I attempted to contact the author, Frank Cerra, to query whether this was a computational mistake or an unexplained conversion; however, none of his web-published email addresses are valid and there was no answer by phone. I cannot rule out that a conversion factor was used that was not described in the methods, and would welcome confirmation or rebuttal of this observation. Finally, I would like to comment on the safety of the TSA officers (TSO) who will be operating these machines, and will be constant ‘bystanders’ with respect to the radiation exposure. The range of exposure estimates is a function of where an officer stands during their duty, what percentage of that duty is spent in the same location and how often the machine is running. A TSO could be exposed to as much as 86-1408 mrem per year (assuming 8 hours per day, 40 hours a week, 50 weeks per year and between 30-100% duty and 25-100% occupancy, as defined by the Johns Hopkins report), which is between 86%-1410% of the safe exposure of 100 mrem. At the high end, if for example a TSO is standing at the entrance of the scanner when it is running at maximum capacity, then that officer could hit their radiation exposure limit in as few as 20 working days (assuming an 8 hour shift). While we may not be very happy with our TSOs at the moment as the face of these policies, we need to keep in mind that they really should be wearing radiation badges in order to know their specific exposure (especially for those officers who may also have to receive radiation exposure for medical reasons). As far as I’m concerned, the jury is still out on whether these machines are safe or even could be made safe for this application. Until then, I suggest keeping your family out of these machines and as vile as it is, either submit to a physical search or just don’t fly. Medical and Health Physics Consulting, Radiation Report on Rapiscan Systems Secure 1000 (March 21, 2006). Medical and Health Physics Consulting, Radiation Report on Rapiscan Systems Secure 1000 (June 5, 2008). Medical and Health Physics Consulting, Supplement to Report dated June 5, 2008 (October 28, 2008). National Institute of Standards and Technology Assessment of Radiation Safety and Compliance with ANSI N43.17-2002 Rapiscan Dual Secure 1000 Personnel Scanner (July 9, 2008). Just to clarify, I am not a radiation biologist, radiologist, health physicist, etc… my expertise is actually in single molecule biophysics and the biochemistry of DNA repair. This article is simply my review of the safety reports published by the TSA on their website, and not the result of any independent evaluation or experimentation. Also, all views and comments are my opinion (professional and unprofessional) and are not endorsed or representative of the University of California or any affiliated departments or colleges. Thanks Anthony for clarifying how to interpret the data from Appendix B. There DOES NOT appear to be a 1000-fold unit conversion error.